Starring Steve Carell, Bryan Cranston, Laurence Fishburne, J. Quinton Johnson, Deanna Reed-Foster, Yul Vasquez, Graham Wolfe, Jeff Monahan, and Cicely Tyson. Those that have been following the acting career of Steve Carell are most likely aware that he has made attempts to shed his comedic image by taking on dramatic roles, particularly ones that also benefit from his natural timing for humor. 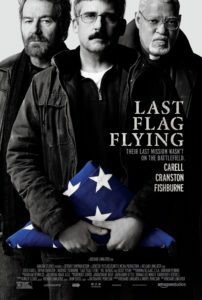 However, in Last Flag Flying (the latest film from extremely talented writer and director Richard Linklater) Carell, playing a Vietnam War veteran 30 years removed from the hellacious horrors of war who in December of 2003 must bury his 21-year-old son killed over in Iraq, is fatigued and depressed. For as much screen time as Steve Carell has, the distant Larry (commonly referred to as Doc by friends) has very few lines. Still, every sentence of dialogue resonates, as Carell pulls off a masterful turn that plays to his expressive body language in ways unlike anything the veteran has ever done. As the film progresses and his buddies slowly began to cheer him up, Doc cracks a smile; it’s an unforgettable image and something I’m convinced only Steve Carell could pull off. He takes this character, and by extension the audience, on a meditative journey contemplating everything from patriotism, religion, friendship, and his own life through this existential crisis. 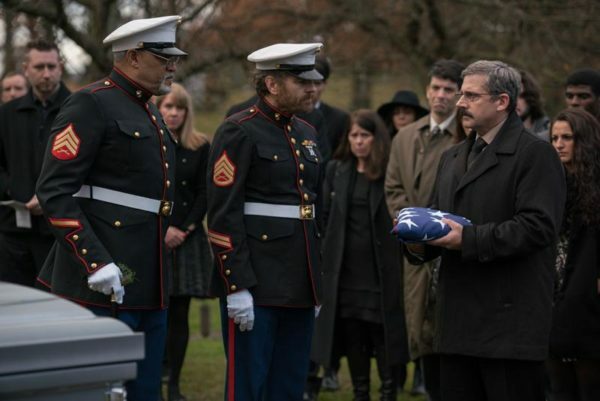 Last Flag Flying paves the way for Steve Carell to deliver a career-best performance that should be nominated for an Academy Award. Regardless of if it is or not, it won’t be forgotten. Already widowed (it’s mentioned early on that his wife has passed due to cancer), the feeling of loss is reaching new, intolerable heights for Doc. He doesn’t know or care for what either he or his son fought for, so once learning that his son didn’t even die in battle and instead was murdered by the enemy while picking up supplies, he decides that he just wants to bring his son home and bury him. No honorable ceremony at the Arlington Cemetery, no government provided transportation to physically get the body back home, nothing. “I don’t want to bury a Marine, I want to bury my son”. Selfishly, the Marine Corps is not too happy about this and tries to persuade Doc otherwise, but he isn’t having it. The grief is too overwhelming, so he ropes two old Vietnam War compadres into a road trip where they rent a U-Haul truck to place the coffin inside. 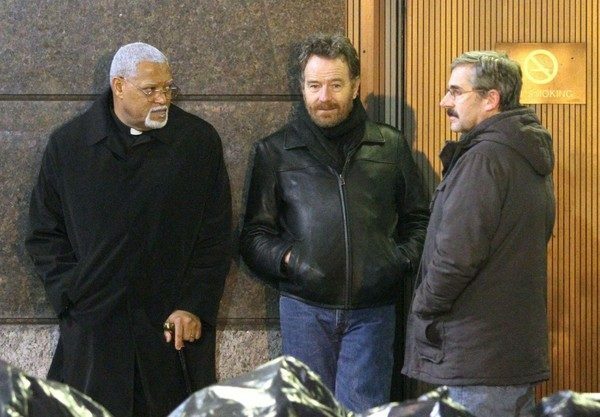 Naturally, it doesn’t go as smoothly as planned, but this allows for more time to get to know all three friends; Bryan Cranston is an outspoken atheist who provides most of the jokes, while Laurence Fishburne plays a Reverand consoling Doc in spiritual ways. 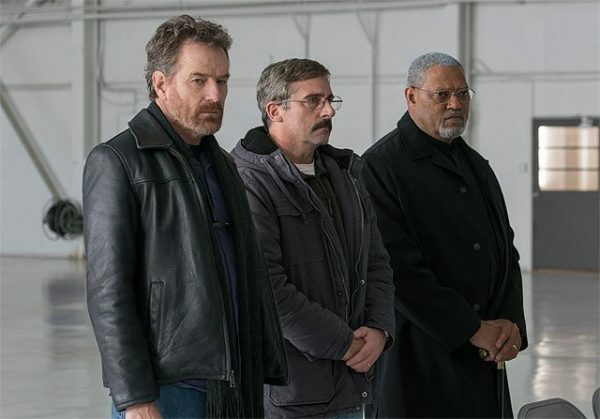 The beauty of the script from Richard Linklater and Darryl Ponicsan (who also wrote the novel) is the elegance in which opposing viewpoints are handled within philosophical discussions; Last Flag Flying isn’t a film about right and wrong, correct or incorrect, regarding the various aforementioned themes. It’s a portrait of a reunion between three friends that went on to lead drastically different lives after the war, and their camaraderie feels genuine. Not to mention, nearly everything Bryan Cranston says is hilarious. There’s an entertaining aside where the three amigos stop at a store to purchase their very first cell phones. I wouldn’t be surprised if this is an effect of making a single movie over the span of 12 years (the critically acclaimed Boyhood), but Richard Linklater is masterful at capturing places and times. Although the reasoning for the get-together is tragic, there’s a growing sense that these three friends have not only reconnected but will continue to stay in touch thanks to the advancements of modern technology. It’s not just a funny screwball moment of three pals cluelessly learning about new forms of communication, instead serving a purpose in the greater picture of it all. Aesthetically, Last Flag Flying features muted colors and a gloomy atmosphere, which is fitting. It’s the sharp dialogue reflecting on a number of pathos that manages to be the invisible brightness within the monochrome visuals. Linklater’s greatest gift as a filmmaker is the ability to create an engaging conversation about literally anything, whether it’s pondering the meaning of patriotism or characters hilariously unaware that Eminem is white, the film stretches the road trip concept far, and somehow without overdoing it. Sure, a few moments here and there feel superfluous or a dialogue exchange goes on too long once in a while, but I also have to admit that I was genuinely surprised when the credits rolled as it did not feel like 124 minutes. So in that regard, the experience definitely stays moving. A large part of that is once again thanks to Steve Carell; he is incredibly moving and owns the movie. That’s no easy feat considering how talented Bryan Cranston is at delivering jokes, especially factoring in a number of ridiculous things he gets to say. Laurence Fishburne also brings good work to the table, switching his Reverend between mannered and foul-mouthed sailor that hasn’t forgotten his roots. 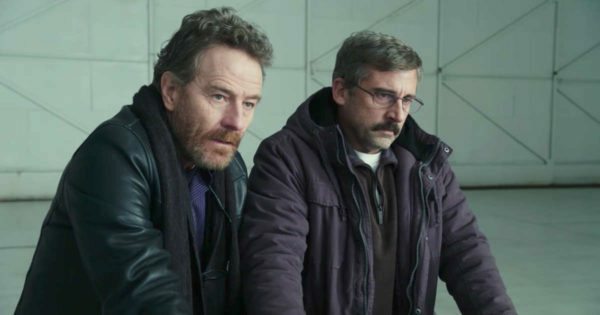 All together under the direction of Richard Linklater, Last Flag Flying is subtly powerful and essential viewing for anyone that has lost a loved one because of a war.